The Ready to Drink (a.k.a. Drinkability) report orders the wines in the cellar by an index number which shows whether a wine is being consumed faster or slower than a rate implied by the drinking window. 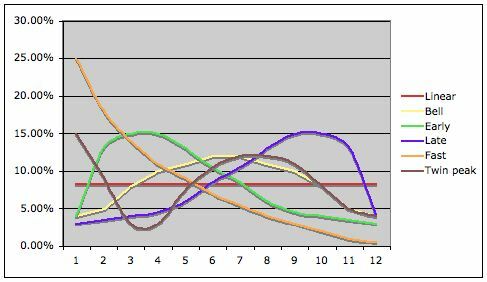 For purposes of simple explanation, let's assume for a moment that you wish to consume a wine in linear fashion throughout the drinking window, although in reality we can model this in more complex ways for different types of wines. 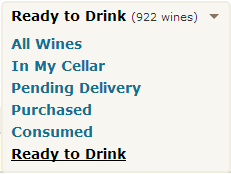 Formerly known as the Drinkability Report, this is now called Ready to Drink and can be accessed from the quick menu in the My Cellar view, or under the Quick Links menu under the search bar. For example: you buy a case of wine with a Wine Advocate suggested twelve-year drinking window. If you get five years into the window and you still have 12 bottles, your index is positive five (5): you still have five bottles to drink. If you get five years into the window and you have consumed nine bottles, you have an index of negative four (-4): you are consuming the wine at a rate that will exhaust it before the window closes. If you get beyond the window and you still have bottles left, the index will be a positive number greater than the number of bottles PLUS a penalty of 100 points, and it will keep increasing as time goes on. If you have not yet gotten to the start of the drinking window, the index will be a negative number that will approach zero as the start-consume date approaches. The index is dynamically calculated when the report is run based on the current date. The formula for the Drinkability Index is described in the next section. The report calculates based on 750ml equivalent. So if you open a 375ml bottle, that only counts as opening half a bottle. The actual count of bottles (if different) is still available by hovering over the various numbers. The report breaks out pending bottles from those in stock, although all bottles are taken into account for calculating a score. The report can be filtered by bottle size, storage location, or bin. The total number of bottles for the wine are still shown (as the drinkability score is computed on the basis of all bottles), and there is an additional indication showing the number of bottles for that specific bin, locale or bottle size. If "Days Used" is greater than the drinking window (fallen off the far end of the window), the algorithm adds a 100 point penalty to the calculated index to emphasize the need to drink up. This can be toggled off. When consuming a bottle in CellarTracker you have the ability to mark it in a number of different ways such as "Drank from my cellar", "Restaurant purchase", "Gave away as a gift", "Sold or traded", "Spoiled (corked/oxidized) and returned to vendor", "Spoiled (corked/oxidized) but not returned", "Donated" and many more. However, for purposes of calculating the drinkability index many people wanted a way to focus the calculations on just bottles that they had actually consumed. So there is a pair of options to either focus on all consumption or just a few categories (Drank from my cellar, Drank by a family member, Lost or missing). I hope people appreciate the tool but also understand that it is simply a tool to help you ensure you are keeping pace with your collection. Feedback is welcome, but since I am very sure that a LOT of it will be conflicting I suspect I won't be able to act on all of it.